Padraig Harrington looks like he’s fading away. Thinner than he’s been in years, he’s even started wearing a heart monitor on the golf course to measure exactly how many calories he’s burning up. But there are no miracle diets for Harrington, who says he eats what he wants. He doesn’t do cardio exercises but has a resting pulse rate of 40. A normal pulse rate for a healthy adult, while resting, can range from 60 to 100 beats per minute. Spain’s Pablo Martin was looking on the bright side after finishing his second US Open on 27 over par. Pebble Beach guests pay around $500 to play the course but Martin was happy he didn’t have to part with a dime of his prize-money. “I’m happy we can get to play for free,” said Martin, a two-time winner on the European Tour, who was heading for a cheque for around $11,000 for his week’s work. Tom Watson’s son Michael that announced that he was retiring from caddie duties following the US Open at Pebble Beach. The 27-year old was carrying the bag for his father for the second time and he knows it will be hard to beat the memories of 2010. In April he caddied at the Masters, proposing to his fiancee amongst the azaleas on the 13th hole. The Watsons played Pebble Beach as a father and son team in the AT&T National Pro-Am in 2007 but that wasn’t the younger man’s first visit to the Monterey peninsula course. He was there in 1982, when his father famously chipped in for birdie at the 17th hole on Sunday to deny Jack Nicklaus the title. Talking of Tom Watson, it was interesting to watch the great man play the famed 17th on Saturday afternoon with thousands of fans clamouring for a better view of the eight-time major winner. The par-three shares a teeing ground with the par-four fourth and Padraig Harrington and Matt Kuchar took advantage of a long wait there to watch Watson play the hole. “Guess you know this hole Tom,” shouted a fan as Watson stepped onto the tee. Watson turned to the crowd and smiled. “I’ve played it a few times,” he said to roars of laughter from the gallery. Alas it didn’t help Watson play the hole any better. He made bogey en route to a one under 70 that left him tied for 16th playing the final round. He needed to finish in the top 15 to ensure it wasn’t his last US Open appearance. But he could also secure his place at Congressional Country Club next year by winning this year’s US Senior Open at Sahalee Country Club. Padraig Harrington insists he has no regrets about the swing tinkering that has smashed his US Open build up. 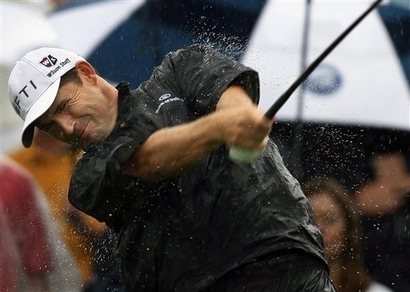 Padraig Harrington gets stick from everyone from couriers to the petrol pump attendants when he goes through a bad run. But the Dubliner was so upbeat after crashing to his seventh missed cut of the season in the US Open that you get the impression he’s not all that worried. 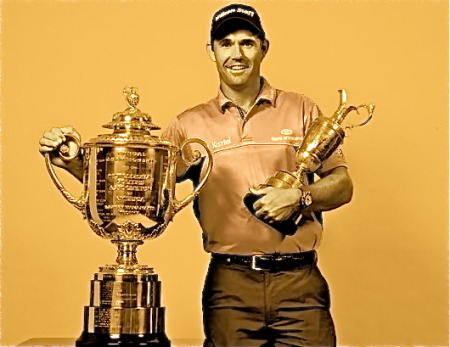 Padraig Harrington won’t give up his search for golf’s special secret or his hopes of winning the Grand Slam of all four majors in one year. But he can’t afford get excited about the stellar major venues this term with the Masters at Augusta, the US Open at Pebble Beach, the Open on the Old Course at St Andrews and the US PGA at spectacular Whistling Straits. Padraig Harrington has confessed that the pressure of trying to win major No 4 is no laughing matter. But eight-time major champion Tom Watson believes the Dubliner’s never say die spirit will see him emerge from the “doldrums”, if that is an accurate way to describe a two-year victory drought.